Wild Boar Adventures has developed a hunt which combines quality wild boars in an environment that provides you with the most realistic hunting situation you would expect anywhere. The 110 acre hunt area is rolling high hills with an elevation that exceeds 300ft from highest to lows points. Fifty percent of the hunt area is trees and bush, deep draws and coulees line the hills with an alkali lake at the bottom. 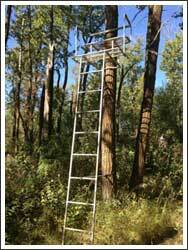 Around the lake are tall black poplars (cottonwood) perfect for self-climbing tree stands. Among the poplars a natural fresh water springs gurgle out year around and the willows grow thick. Up on top the alfalfa grows in a rolling hay meadow, where the boars go to feed in the evenings. The area is large enough and diverse enough that you may not even hear your partners shot while on the hunt. Expect the terrain to be generally dry, so that running shoes could be worn most times with the exception of Spring run off, rains , the heavy dew in the hay fields in summer and around the various water holes. A person hunting from a blind or stalking the hillsides would not need waterproof boots. If your hunting early season or going into the springs/waterholes you may want a high top waterproof boot. The best time to hunt is when you like to hunt, we hunt all year long. You may like snow and cold or you may like warm and green. 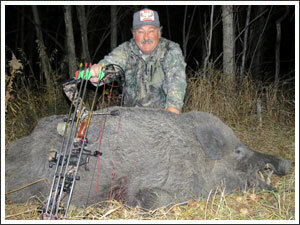 We guarantee, you will get opportunities to shoot boars, so pick the climate and conditions you’d like to hunt in. When you hunt with us you do not have to buy a license/permit or tag. We have all the documentation you will need. All of our hunts are booked in three day slots, Friday –Sunday or Mon-Wednesday. Check in, can be after 4:00 the day before your hunt. Check out on Sunday’s is before 4:00pm. Mon.-Wednesday hunts, check out can be Thursday morning. 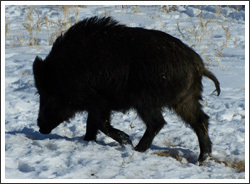 We strive to have good quality European wild boars on the ranch. They have long flat heads, short pricked ears, high shoulders and low hips. Most boars are a grizzled browny silver color, but you may also see some dark brown, black, even blonde colored boars. Boar is a generic name for all genders of boar. Sows, and piglets can still be referred to as “boars”. 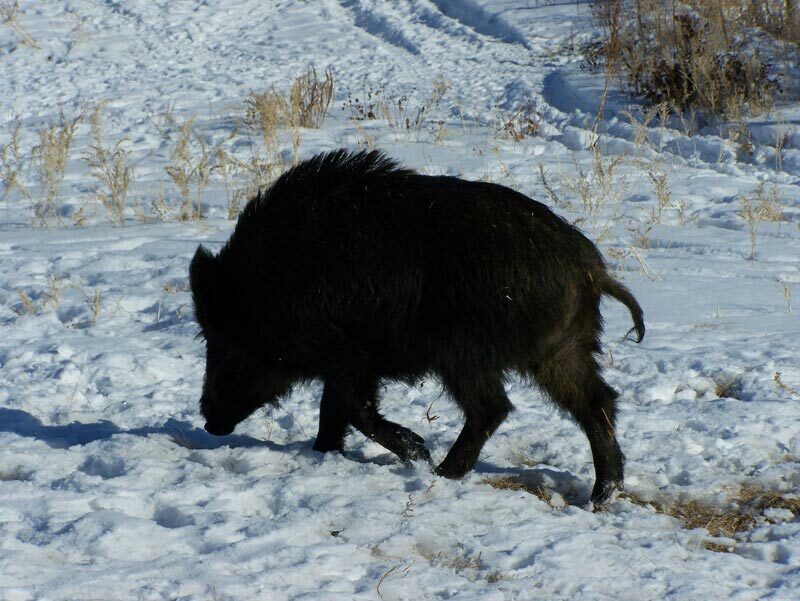 We generally have somewhere between 50 – 100 boar in the hunt area at a time. They may range from 50lbs to 400+lbs and can be weanlings, sows or boars. There are sows that are producing piglets right out in the bush in the hunt area, we ask all hunters to refrain from shooting nursing sows or sows with piglets at heal. Although this is a “do it yourself” hunt, we will offer some suggestions to help you be successful. There are many ways to hunt these boars, but let me start first by saying that a boar that has been hunted is no longer a “dumb” boar. You may need to use all of your skills to kill a hunt wise boar. Our goal is safety and with multiple shot, centre fire rifles we have found there is a greater risk to the boars and others when multiple shots are fired at fleeing animals. We hope this is not a huge inconvenience. 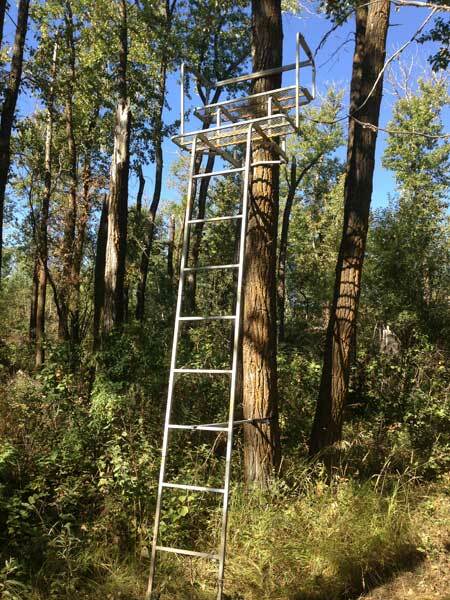 We have provided for your convenience some ladder stands, tree stands and a shooting house. You may also want to bring your own tree stands or ground blinds. The trick is to beat their noses, if they smell you you’re finished. You must play the wind and stay downwind of them as with all game, however these guys have “bionic” noses. Having the ability to move your blind or stand if the wind changes is very important. Also a ground blind gives you the advantage of the boars NOT picking up on your movement, especially if you’re a bow hunter. One of the most effective ways of killing a boar is by finding sign in the heavy cover and then moving into that cover staying downwind and being very patient. Many people want to get out and walk and that’s great, spot and stalking can be deadly. If you decide to do this, use your head twice as much as your feet. Think about wind direction, walk with it in your face, walk slowly and scour the area for boar. Boars will hold tight, very tight. In fact if your quiet enough you may step on them, but if they detect you they will take off like they just got fired from a cannon and you will probably need to go back to camp for clean up! Pay attention to your wind, noise and look for small things like an ear or leg. Don’t assume there is nothing around. In the evenings field edges are the place to be, stay low, careful not to be in the open, anticipate where they will come out and tuck back in the trees. Baiting can work very well, we recommend dry dog food, but some have brought apples or various things that have worked well. Bait is put out the night of arrival in small quantities in various locations. Trail cams can be helpful. 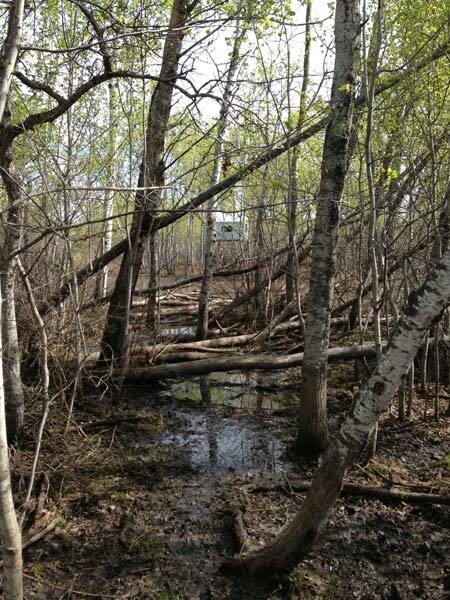 The next morning the locations are checked for activity and blinds or stands then placed. 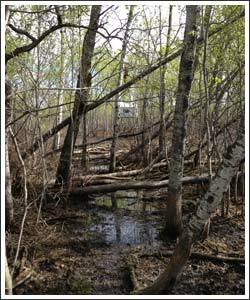 Baits can be sat at all day long, but depending on location some will be more active than others during daylight hours. We do have some “pig pipes” which help to slow down the consumption of bait. Calls have been used with varying success, but you’re welcome to try it all. Whitetail buck grunts blown subtly have worked as well as baby pig in distress, again they are not stupid so set up seriously as if you’re calling coyotes. 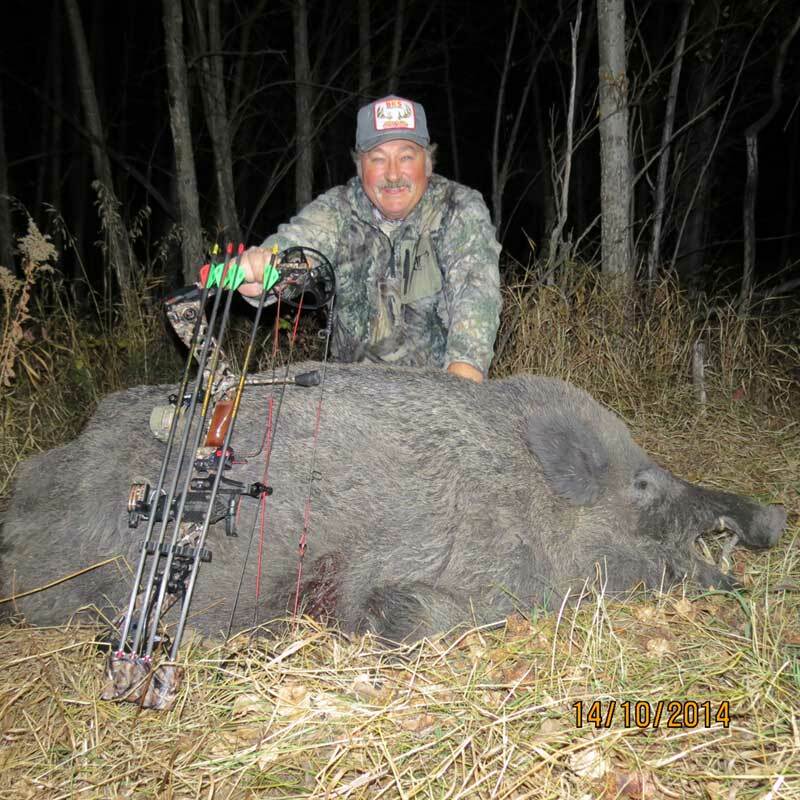 When you hunt at Wild Boar Adventures you are not hunting with people you don’t know. All our hunts are booked exclusively for you and your group. You decide who you will be hunting with and the whole area is yours for your hunt. You can leave your equipment in the bush and no one will touch it. The cabin is located in a big basin in the hills where you’ll swear there’s no one for miles.